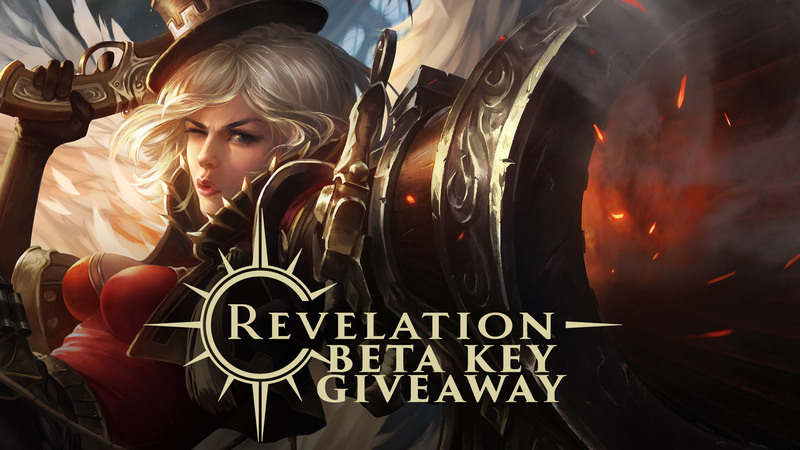 We are giving away 10 Beta Keys for the upcoming Closed Beta this month for Revelation Online. If you'd like a chance to win one of the keys, reply to this thread and tell us what are you most excited about Revelation Online.. This giveaway will run through October 7, 2016 . Everyone eligible will enter a random draw and the winners will be announced and contacted shortly after. BONUS ENTRY: Earn a Bonus Entry by joining on our Discord (https://discord.gg/es4dagr) channel and dropping a line at the #evelation channel. Disclaimer: Giveaway end date is subject to change depending on final closed beta dates. CONGRATULATIONS! Check your Messenger for your beta key. Like most of the games I played, one of the important aspects that makes me excited about an upcoming MMO is the PvP itself. I'm more of a PvP type of player. I've played the Chinese version ( with an English patch ) and I loved the fast paced PvP. The only thing that would hinder me on the upcoming NA server would be my ping since I'm living in Asia region. The graphics and visuals are exceptionally great as well as the combat mechanism throughout the game. The movements feels smooth. Dodging is phenomenal. It feels like an upgraded version of Aion and Tera combined in one game. Flying is also one of the biggest factor that I love on this game since I like to explore throughout the game's continent. I have been longing for another MMO since I left gaming after I got work. I would like to play this new game together with Dota2 and Overwatch if I will be lucky to win. A Good MMORPG is hard to find in this generation but i think i see potential in this Revelation Online, that's why i really want to have a CBT key to play this bad boy. Graphics are good, Contents and Gameplay is good based on the trailers that i watched. Thank you for this Giveaway! God Bless. Just wanna try this game out and see if I can get a fresh new start in an MMO again. I have been playing mmorpg's since ragnarok first came in the Philippines. It has been a while since I got excited for a new MMO. This game looks like a combination of some of my most favorite MMOs (aeon, blade&soul, tera online). Besides that, another reason I'm excited for this game is playing with the Guild exitializ again like I did back in Dragon Nest SEA. This guild has lots of supportive members who helps and welcomes newbies. Hopefully i can join the guild again if ever they are in it. See u guys online! I'm most excited about its end game contents. Both its PvP and PvE looks promising, I hope that the enjoyment this game can bring will make me play for atleast half a year. Looking forward to its Open Map PvP and also for PvE. Guild/Clan war looks promising with that wings. I hope many players come and play this game! its time to dominate Nuanor. Exitializ! Revelation Online is an ambitious and breathtaking new MMO in which players explore a vibrant world of ancient mystery using the power of flight without boundaries. Other than the highly touted flight system, Revelation Online includes several PVP modes, like a Last Man Standing arena, sieges for up to hundreds of players, as well as PVE raids, requiring teamwork and tactical gameplay. The starting storyline is brief, as players will learn to spread their wings and unravel a legendary myth about a mysterious artifact in the living and vibrant world of Nuanor. evelation Online will feature open world PvP, duels, battlegrounds, arenas, castle sieges and territorial wars. The open world PvP will not be available until level 40 though, to ensure a nice leveling experience for all players. There will be 10 vs. 10, 20 vs. 20, 30 vs. 30 PvP-battles and even up to thousands of players at a time can take part in the currently under development cross-server battles. My friend told me about this game and i search the game on YouTube,the gameplay the PVP,wings and mounts,the graphics my eyes has been blessed,im waiting this game to be released give it a try i hoped i win in this giveaway,the thins i want the most is the PVP and guildwar because its like a clash lol and PVP/Guilwars with wings is so damn cool. This is my will be my second mmo which is my type This game met all of my favorites of an mmo T_T and i want a beta key so badly, the features in this game is so awesome all of it and most of all the OPEN WORLD type which is i really like for an mmo, no more Loading Screens. Winners have been announced and contacted. Thanks for joining!